The KM681002A is a 1,048,576-bit high-speed Static Random Access Memory organized as 131,072 words by 8 bits. The KM681002A uses 8 common input and output lines and has an output enable pin which operates faster than address access time at read cycle. The device is fabricated using Samsungs advanced CMOS process and designed for high-speed circuit technology. It is particularly well suited for use in high-density high-speed system applications. The KM681002A is packaged in a 400mil 32-pin plastic SOJ or TSOP2 forward. By Samsung Semiconductor, Inc. 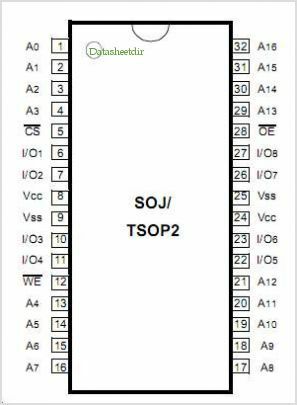 This is one package pinout of KM681002A,If you need more pinouts please download KM681002A's pdf datasheet. KM681002A circuits will be updated soon..., now you can download the pdf datasheet to check the circuits!